I was instantly distracted. A shiny penny again Zulu? At the moment I was ready to write a completely different Letter W blog, I got a text with a news story. It was about some recent revelations about Sean Hannity; the Fox News “public figure.” I don’t really want to get into it here, but I was suddenly shocked when I learned that Hannity makes 36 Million Dollars a year to spew lies, hate, and discontent. To anyone who is actually paying attention, his programming is such nonsense, that he is mocked by the Fox Newsroom as an “entertainment personality” and not the figurehead of a legitimate news program. Not one to follow entertainment news and salaries, I began to think about other salaries. I looked up a few of them, and besides the absurdity of all of it, I wasn’t surprise to find out some of the highest paid. I Knew “Ellen” and “American Idol” would be “up there” as well. Bill O’ Reilly from Faux News, before his firing last year, was involved with at least 6 sexual harassment lawsuits; the last being a settlement for 32 Million Dollars, so it comes as no surprise that he had a salary of 37 Million. But now comes the “coup de grace.” (pronounced; coo de gras). It’s Judge Judy! She makes 47 Million Dollars per year!! 47 MILLION!!!!! ……….did I say 47?…….. I meant 47 %*! @#$ MILLION!!!! As a disclaimer, I don’t hate, blame, or disrespect Judy Sheindlin, a.k.a Judge Judy. Good luck to her. I saw an interview with her once; she was charming, interesting, and funny. She is an actual attorney and a judge, but let’s add some perspective. Judy works 52 days per year. Forbes Magazine lists her as the 4th highest paid entertainment celebrity earing, get this……..47 Millon Dollars per year……..(ah Zulu, stop it NOW!). Judy is basically an arbitrator for what is usually a “colorful cast of characters,” and often in her role, she is not much more than a high school principal mediating petty disputes between adults with juvenile behavior. At the opposite end of the spectrum is a Chief Justice of the United States Supreme Court; one leg of the most powerful trio of government in the world. The outcome of their decisions decides life and death matters, models of industry, peace and war treaties as well as the behavior of the United States of America. That Chief Justice makes $223,000 per year. The remaining Justices make $213,900 per year. So, what’s the real thorn beneath my fingernail in all this? Trust me; it’s not the salary of Judge Judy who makes………DON’T SAY IT……..well you know. It’s people in general. 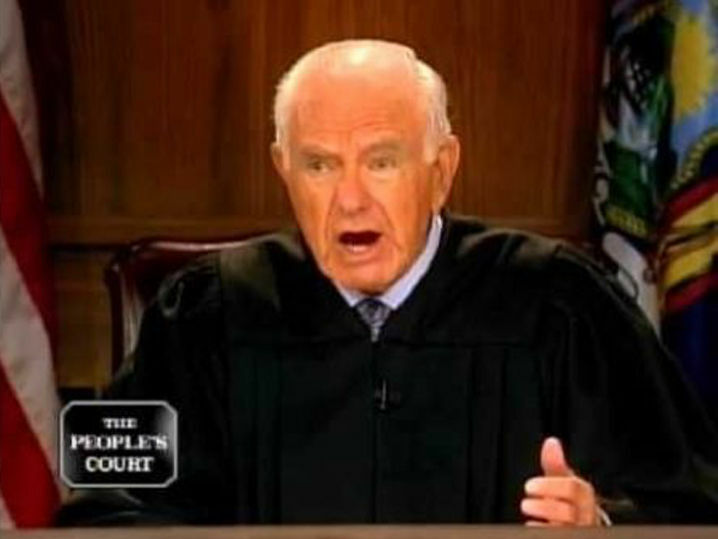 If the show is that popular to pay out that kind of money, I can only imagine all the people who watch it all the time and can recount every episode in detail, but who have no idea how the “heavyweight of justice” over at the “real people’s court” operates, much less what kind of issues are being dealt with. I don’t have every detail of every case before the supreme court, but I know “real justice” takes more than 22 minutes to sort out. I wish people would pay more attention to the larger issues at the courts. The world might be better off for it. Judge Judy is in my living room every afternoon at 4.30. Jimmy thinks she’s great. I think she can be a pain in the arse and not always right or fair! But jesus, she’s rich isn’t she!!! !